This post is sponsored by Lionsgate’s new film Early Man, in theaters February 16. Have a ball creating these Early Man Cupcakes using modeling chocolate (candy clay). In this video tutorial you will learn how to make Dug, the movie’s main character. With his toothy grin and messy hair this caveman looks so cute as a cupcake. Meet Dug. He’s the brave caveman who unites his tribe against a might enemy and victoriously saves the day in the new movie Early Man. I am so excited to see the film, set at the dawn of time, when dinosaurs and woolly mammoths roamed the earth.The movie arrives in theaters on February 16 and stars the voices of Eddie Redmayne, Tom Hiddleston, and Maisie Williams! I can’t wait to see what adventures Dug and his buddy Hognob get into. I am such a huge fan of Aardman’s claymation. They created the lovable Wallace and Gromit, two of my absolute favorite movie characters, Shaun the Sheep, cutest sheep ever, and Chicken Run, go chickens! I am in such awe of the clay figures in their movies. I can only imagine how much effort goes into creating a claymation movie. The characters really come to life. It’s incredible to think that each frame of these films are made by painstakingly sculpting the people, animals, and scenery out of clay. Looks like so much fun, doesn’t it? Don’t you just love all these kooky looking characters? Each has exaggerated features like boney knees, big lips and even bigger teeth. When I sat down to create these Early Man Cupcake I decided to sculpt Dug and Hognob using and edible version of clay. I chose modeling chocolate, also known as chocolate clay or candy clay, which has similar texture to real clay but tastes like chocolate! 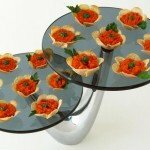 It’s the perfect medium to use to decorate any sweet treats and is wonderful on cupcakes. It looks very similar to fondant but tastes so much better. Modeling chocolate is malleable enough to sculpt, holds it’s shape once it dries, and, best of all, melts in your mouth. Bite into one of these Dug cupcakes and your teeth will easily cut through the modeling chocolate decoration. It tastes so good that no one will want to peel it off before eating, like they do with fondant. 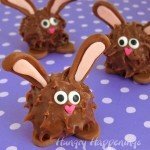 Modeling chocolate can be made easily using two ingredients. 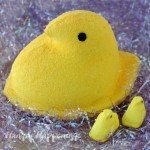 You simply blend together chocolate or candy melts with corn syrup. 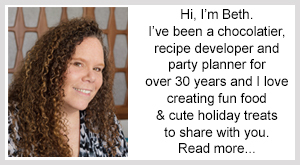 You can find the recipe on my Chocolate Making Tips Modeling Chocolate Recipe Page. To make the skin toned modeling chocolate to make the Dug cupcakes, start with white modeling chocolate and add a tiny bit of orange coloring then tone it down with a tiny bit of brown. I usually have a bunch of different colored candy clay stored in zip top bags, so I just pinch off pieces and blend the colors together to make what I need. It’s actually a good idea to color small pieces of white modeling chocolate then blend them together. You can control the color a bit better that way. I used bright white candy melts to make the white candy clay used for Dug’s teeth. If you use pure white chocolate, which often has a yellow or off-white hue, then you can blend in some white food coloring to make it a more vibrant white color. Not that cave men had bright white teeth. A bit of yellow wouldn’t be too bad, actually. For the eyes, you can create them using white and black modeling chocolate or simply use candy eyes. You’ll notice I tried both methods. Both of my Dug cupcakes look slightly different. 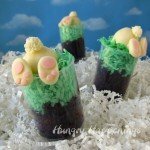 To make Dug’s hair, pipe chocolate frosting through a grass pastry tip. Watch the video below to see how to create his messy locks. To make these Dug Cupcakes you’ll need a few tools. Clay Extruder – if you press modeling chocolate through a clay extruder fitted with a single hole disc you get perfectly shaped tubes for Dug’s big full lips. Full lips and big mouths are an Aardman signature feature. 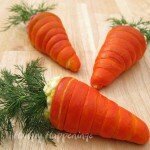 You can hand-roll them but a clay extruder is a cheap tool that you will get a lot of use out of with other food craft projects. Just be sure to only use it for your edible clay. Round Plunger Cutters – use plunger cutters to easily cut really small circles for Dug’s teeth. I have a whole drawer of plunger cutters in various sizes and shapes. They are so much easier to use than small metal cutters because they push the modeling chocolate out once cut so you don’t have to push it out using a skewer creating indentations. Grass Pastry Tip – perfect for piping a lot of frosting hair onto a cupcake. Dug has a lot of hair so this tip is a must have. 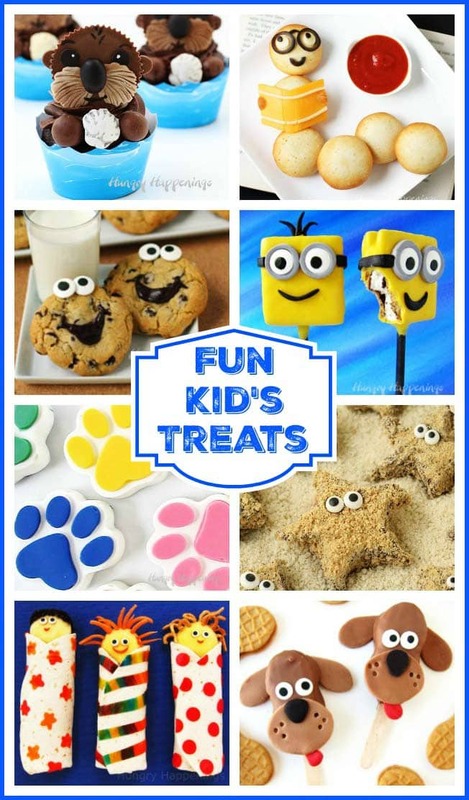 You’ll also need cupcakes, chocolate frosting, and candy eyes. 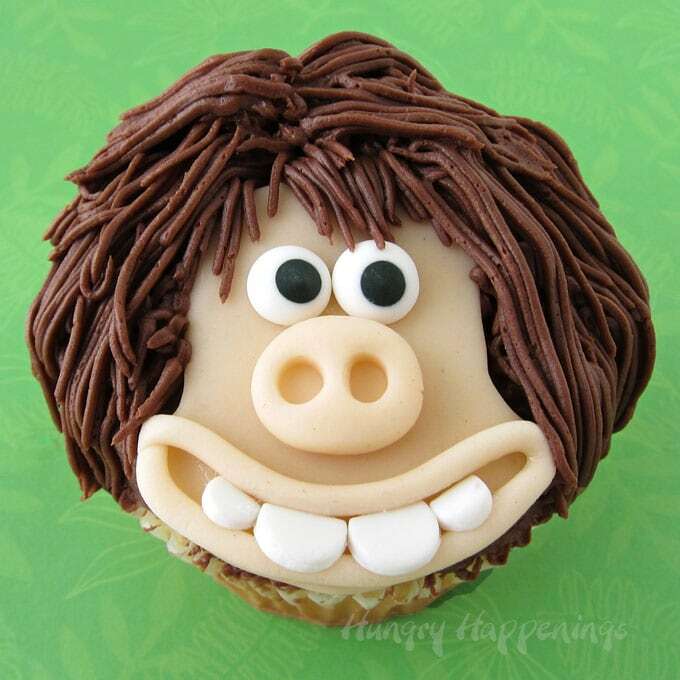 Modeling chocolate decorated cupcakes look just like Dug from the movie Early Man. Pinch off about 1/2 tablespoon piece of skin colored modeling chocolate. Flatten and shape into Dug's head. Press some skin colored modeling chocolate through a clay extruder fitted with a single hole disc creating long tubes. Brush clear piping gel along the bottom (chin) edge of Dug's head and press a tube of modeling chocolate along the edge creating the lower lip. Wrap the tube around at one corner and create the upper lip, leaving the mouth open. Cut off any excess and pinch the two edges together to form his open mouth. 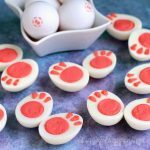 Roll the white modeling chocolate out really thin and cut two small circles and two even smaller circles using round plunger cutters. Cut 1/4 off each circle creating teeth. Brush some clear piping gel just under the upper lip. Insert the four teeth up against the upper lip. Pinch off a small piece of skin colored modeling chocolate and shape into an oval shaped nose. Use piping gel to attach it just above the mouth. Use a wooden skewer or lollipop stick to make to indentations for nostrils. Attach two candy eyes using piping gel just above the nose. Frost a cupcake with chocolate frosting smoothing out the top. 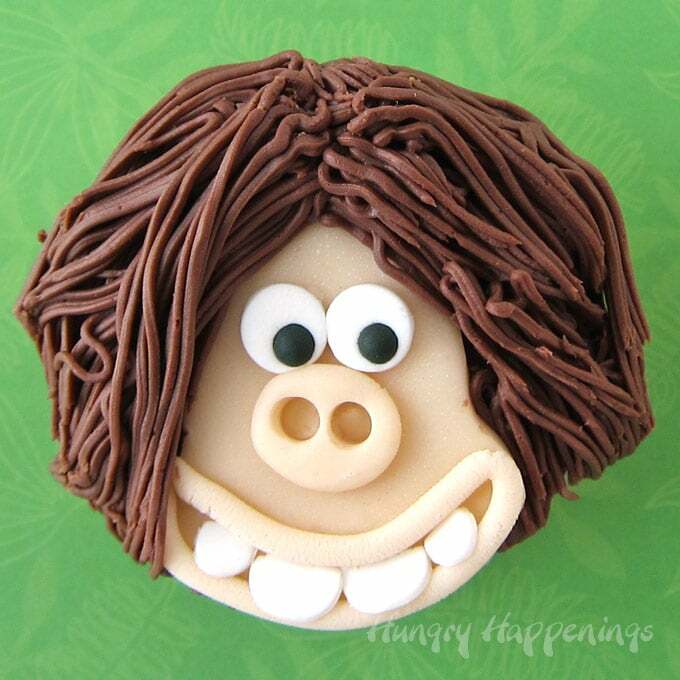 Set a modeling chocolate Dug face on top so that the chin matches up with one edge of the cupcake. Spoon chocolate frosting into a pastry bag fitted with a grass pastry tip. Pipe frosting hair around the face. I was compensated by Lionsgate to share this project with you but all opinions expressed here are my own. I hope you have fun making these Early Man Cupcakes. 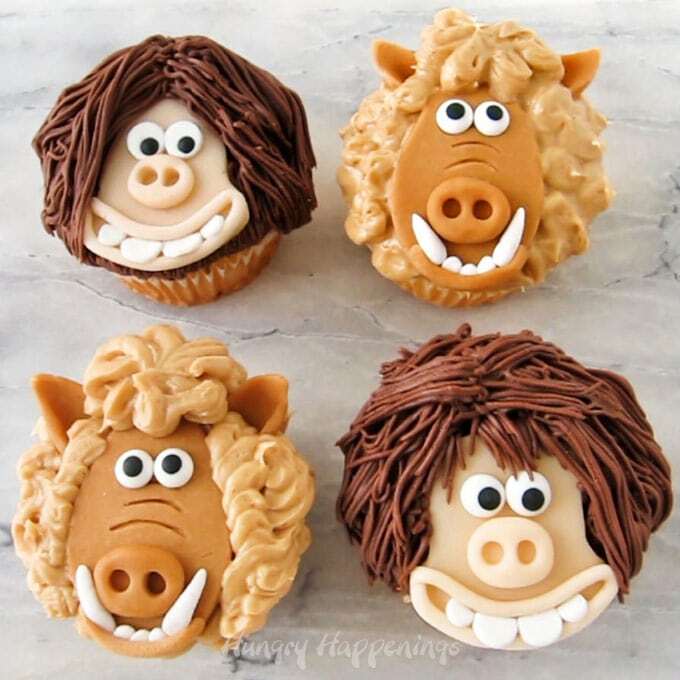 Once you learn how to make Dug cupcakes, be sure to check out my tutorial on how to make Hognob cupcakes. If you make and share these Early Man Cupcakes online be sure to link back to this blog post, mention Hungry Happenings, and use #hungryhappenings. Previous Post: « The BEST Chocolate Mousse Recipe You’ll Ever Try! 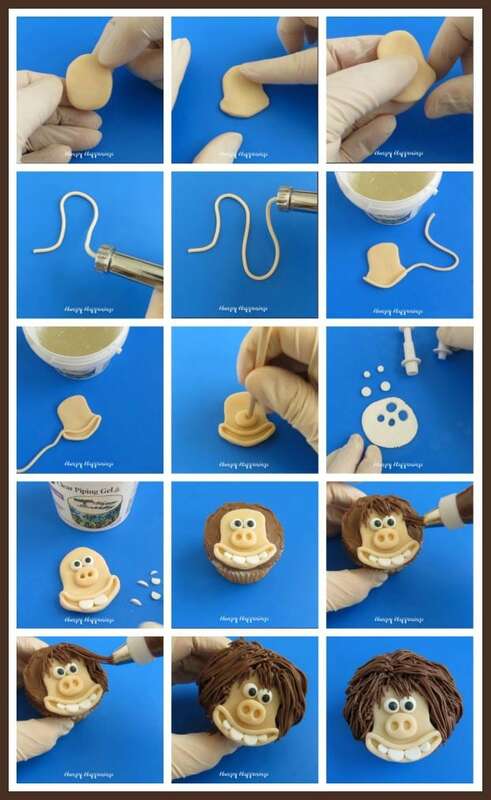 These cupcakes totally make me smile, so clever and cute! Dug is such a cute character. He was fun to turn into a cupcake.